Film Star Dan Aykroyd, Ned Beatty, John Belushi, Lorraine Gary, Chritopher Lee, Toshiro Mifune, Warren Oates, Sam Fuller, Slim Pickens, John Candy. 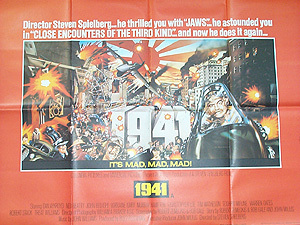 Details Steven Spielberg directs this madcap comedy about how L.A. might collapse into chaos over the threat of Japanese invasion following Pearl Harbour. The poster art has a busy quality suiting the film with a red and white Japanese framework.